Hedging a stock portfolio using index futures can mitigate risk. 1. Why Do Some Stock Index Futures Move Differently Than Others? 3. What Is a Hedging Transaction? Investors have a number of available options that will allow them to mitigate their exposure to an adverse movement in their stock portfolios. One of the best ways to hedge a portfolio of stocks is to use an index future. Many large cap stocks move in tandem with an index when a large adverse move happens in the stock market. The idea behind hedging risk is to mitigate an investor’s exposure to the volatility of stock prices. If an investor owns a portfolio of stocks, his exposure is to a downward move in stock prices. 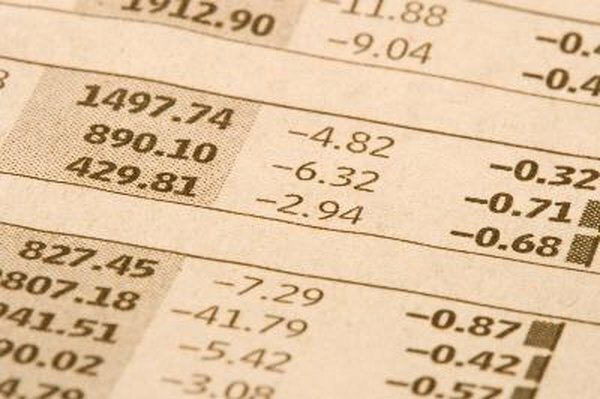 Hedging can be accomplished with many different types of financial instruments -- including a stock index that represents a proxy for a portfolio of stocks. Investors at points during their investment life may decide to reduce risk. This can occur as they become more conservative or if they change their view on which way the stock market will go. Hedging risk has a number of benefits and can be accomplished by using stock index futures. A futures contract is the obligation to purchase or sell a specific underlying product on a certain date in the future. The S&P 500 index contract is the most widely traded U.S. futures contract. The contract is traded on the Chicago Mercantile Exchange. The Dow Industrial index contract and Nasdaq 100 contract are also traded on the CME. Futures contracts are levered products, meaning that investors can control higher levels of capital while posting only a fraction of that capital in a margin account. To open a futures account, an investor must contact a futures broker who is a clearing member of a regulated exchange. Investors who want to hedge their portfolios need to calculate the amount of capital they want to hedge and find a representative index. Assuming an investor wants to hedge a $350,000 stock portfolio, she would sell $350,000 worth of a specific futures index. The S&P 500 is the broadest of the indices and is a good proxy for large cap stocks. One futures contract of S&P 500 is valued at $250 multiplied by the price of the futures contract. If the index price is nearly $1,400, the value of an S&P 500 index contract would be $350,000. The E-mini S&P 500 contracts, which trade in tandem with the standard contract, are 20 percent of the value of the standard contract. Each mini-contract is $50 times the price of the S&P 500 futures contract. To hedge $350,000 of stock exposure, an investor can sell short one S&P 500 futures contract or five E-mini contracts. Before expiration of the futures contract, an investor would need to either buy back the contract or roll it into the next quarterly contract. CME S&P 500 contracts expire in March, June, September and December.